School timetable is example of how to use REDIPS.drag library. Page layout contains two tables: left table with school subjects and timetable on the right. After subject is placed to the timetable, button in the same color will be displayed next to the subject (clone object). Please note two checkboxes in the upper left corner of timetable. First checkbox is turned on by default to enable cloning subjects across a week. 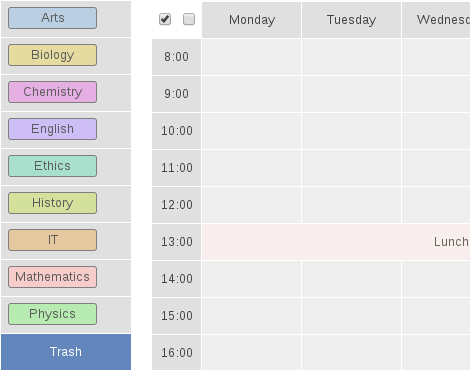 You can turn it off for placing single subject to the timetable. If second checkbox is checked, then “subject report” will pop up if report button (button next to subjects in left table) is clicked. At the same time, all other subjects will be hidden. Clicking on any element in left or right table will show up all elements. The following code shows event.dropped() event handler (with logic for cloning DIV elements across a week). Is it possible to save content from more than one table? I see var content = REDIPS.drag.saveContent(‘table2’); in the script.js but how will I be able to differentiate between the two or more table ids? Right now the tbl_id in redips_timetable auto increments, could I use that to differentiate for each table? Never mind, I found how to do it with your AJAX example. Thanks for providing this library to the public! On my screen it’s correct but I cannot drag it. OK I understand why and it runs correctly now. I can save the clones by savecontent in Mysql -> it runs. But now I want to read Mysql to see the clones I wrote before. How do you save two subjects in the same cell if you change drop mode to multiple? method GET is not good for me, it truncate at about 100 rows (too limited). I need to use POST method for content variable in script.js and read that variable in db_save.php, but i have no idea, $.ajax give my an error ($ not defined). Can you help with this, please? Thank you! @cata mitu – Please see redips.save() method in example22. In this example form elements are send to the server using POST method. This code can be slightly modified for your case because AJAX call functionality is already built-in in REDIPS.drag lib. @SIVA SEMMANKADU GANESAN – Client code is the same no mater what is on the server side. Server side should accept parameters, process and save to the database. Please see example03 where is prepared case for the PHP and MySQL. on start drag (event.clicked) ? How can I change background color of blocked cell when star drag and turn original color when stop? Example: Arts can’t placed in Monday. And Math dropped on 11:00. I have no idea to give this feedback to user before hover de cell. Hi, event.moved() is called in the moment when DIV element is moved from its home position – this can be considered as start dragging. For drag stop please see description for event.dropped() and event.droppedBefore() handlers. With using this event handlers, it’s possible to write some custom JS code to change TD background colors. Sorry for the duplicate message, I thought the first one was not sent. This is part of my code under construction. It’s working for now.